[Classic Post] Using Paired Texts to Teach Personal Safety—with FREE download! This is a guest post by Lesley Boatright that originally ran in May 2014. If you like what you see here, check back frequently for more posts from here and click here to read her blog, Practice Makes Perfect. This week, I wanted to make sure my children were aware of personal safety rules by using paired texts from the Story World Real World series: Little Red Riding Hood and Stay Safe. 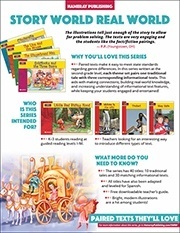 I displayed both texts and had the kids identify which story was the fiction story and which was the informational text. They were able to tell immediately which was which, and they also remembered the reasons why, such as illustration versus photo and animals acting like people versus real people doing a real thing, riding in a car. Then I read Little Red Riding Hood, and we discussed what Little Red Riding Hood did that was not a safe thing to do. This lead to a discussion of ways to keep ourselves safe, with the primary focus being on stranger awareness. Next, I read the informational text Stay Safe, telling the children there were more things that they had to be aware of to keep themselves safe. We read and discussed each point in the book. After reading, we made a list of ways to stay safe on chart paper. From there, I told the children they would work with partners to create a class safety book. This safety book is geared toward the summertime, which gives you plenty of time to acquire the books and work it into your lesson plan for the late spring. They could use one of the rules we came up with on our chart, or add a rule we hadn't discussed. Most children chose one of the rules from the chart, but some did choose to elaborate a bit. The final step in our quick lesson about staying safe is for the children to create this foldable mini-book. This way, the children will have their own book with their top three summertime safety rules! If you would like your own copy of the pages I used to create these booklets, you can download them for free at the bottom of this page. Lesley Boatright is an Early Childhood/Elementary Education teacher from Southwestern Pennsylvania. After graduating college, she moved to South Florida, where she taught kindergarten in the Palm Beach County School District for 8 years. After having children, she decided (with her husband) that Florida was too far away from the rest of the family, and she moved back to her hometown, where she took a few years off to spend time with her son. She has been teaching in the parochial school system for 18 years now, first at kindergarten, and currently in a first grade classroom. Lesley has also taught 2nd and 3rd grade Spanish and 4th grade social studies. Visit Lesley at her Facebook page, blog, Pinterest, and on Teachers Pay Teachers to get great teaching ideas. For more information about the Story World Real World series shown in this post, click here to visit our website, or click the image on the left below to download a series information sheet with key features. To download the booklet sheets, click the image to the right.